Some time ago, I promised to share my ongoing adventures in plaster. Well, here is step one - clearly a work in progress, but it was so exciting to put into action the first steps of the ideas in my head! 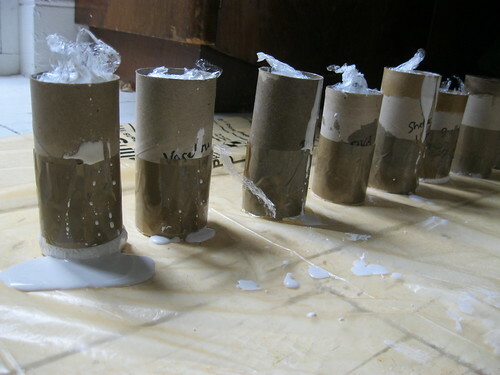 Above, the experiment in which I tested what materials would best insulate the toilet rolls against the sogginess of plaster. 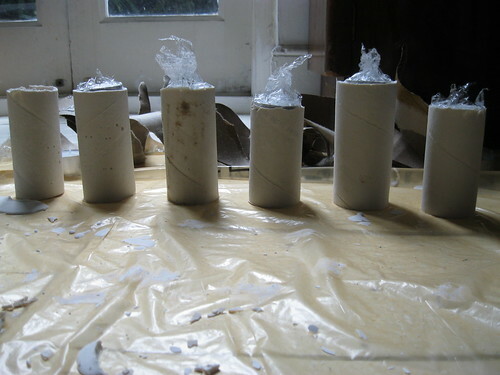 Below, the plaster cylinders after the tubes had been removed. Still with cling film tea-lights in the top, as one of my thoughts is to make tea-light holders.